We often look for famous sites when we travel. We’re busy constantly moving from one famous site to another. That’s true not only when we travel through a physical space, but in our journeys of time into history and memory. With our perception of history, we move from one major incident to another. In reality, however, vast time and space exists in between connecting those dots of historical incidents and famous sites. Travelers to Gwangju will also look for historical landmarks when they first visit the city, but the city simply would not have existed without the space and time in between those historical events and landmarks. Indeed, some travelers find joy in just exploring those in-between spaces and time. 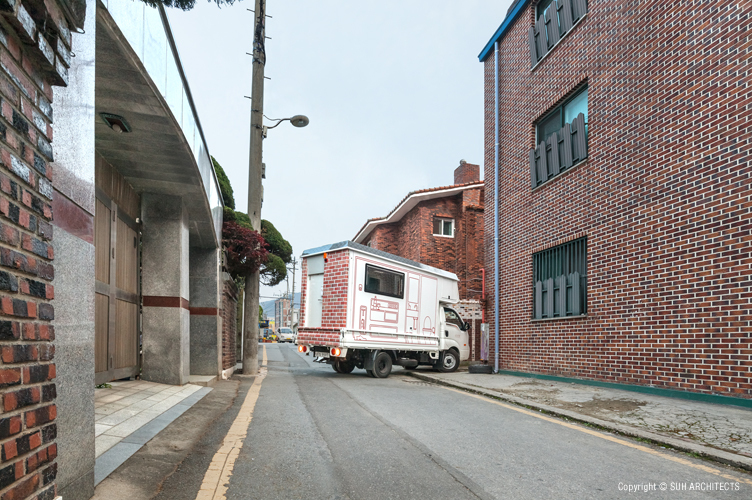 For those travelers in particular, the artist Do Ho Suh is offering “In-Between Hotel” with his collaborators. Among the collaborators, Suh Architects have designed the interior and exterior of the hotel, and worked on the graphic and logo design. Kia Design Center has selected the material and color of the space, while Studio Wy + Urbanindex.Lab have researched and studied sites in Gwangju where the hotel will sit. Imagebakery has made video and multimedia designs related to the hotel, and made contacts to secure locations. Kia Motors sponsors the construction of the hotel. Ramada Plaza Gwangju provides the guest service for visitors to check in and out, while Simmons Beds provides the hotel’s mattress. 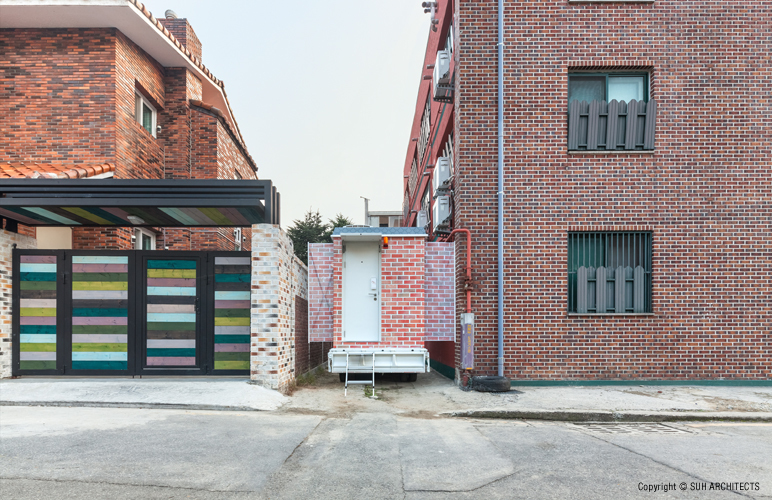 In-Between Hotel, as the first of the 2nd Gwangju Folly Project, will quietly appear in between houses and shops here and there on ordinary streets throughout Gwangju city, beginning with the start of 2012 Gwangju Biennale. 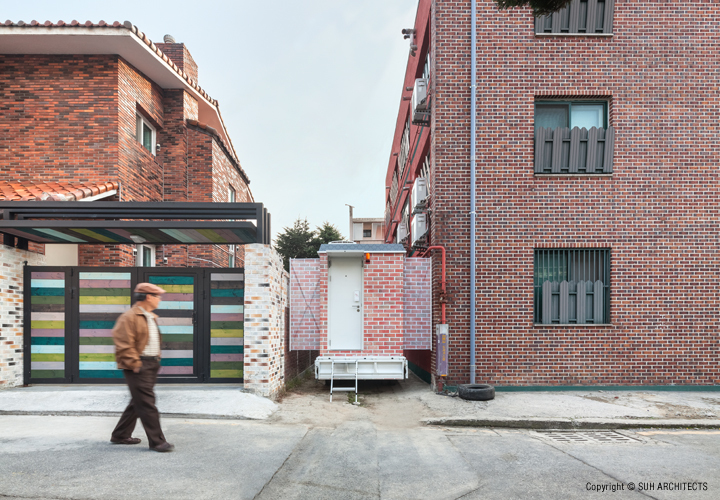 A citizen of Gwangju could find the hotel on a small empty lot next to their house. It will be located in two layers of in-between spaces; it will squeeze in between two buildings, which are in nameless spaces in between famous sites. 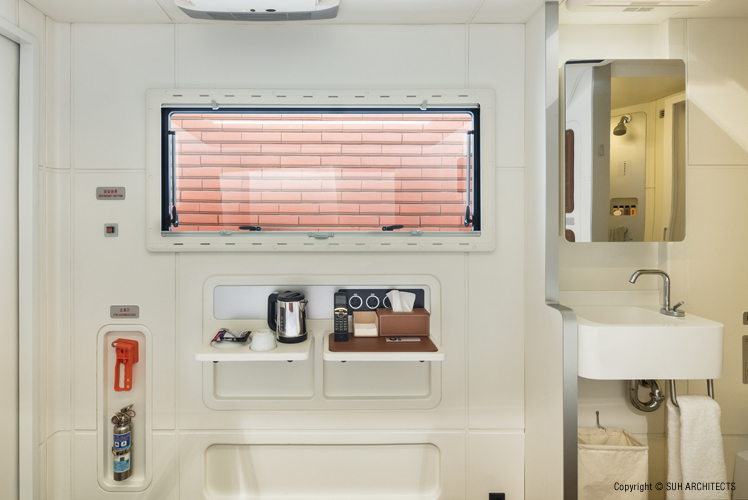 The In-Between Hotel will be able to move from one spot to another, because the hotel room is inside a truck. 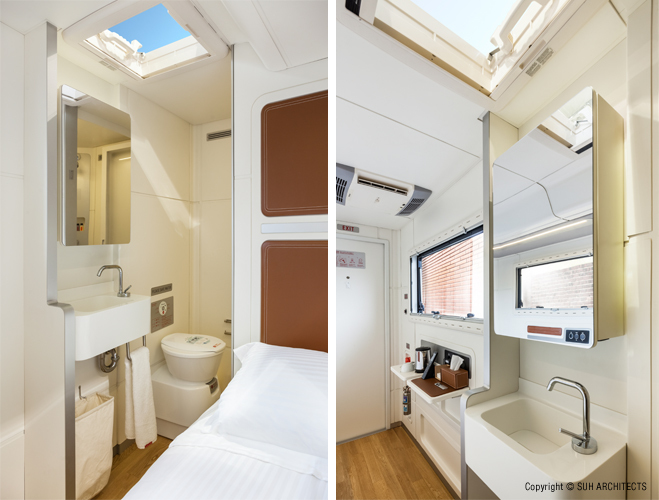 The interior of the space, however, is not that different from ordinary hotel rooms — it’s got a bed, a TV and a toilet. The only difference from other hotels is that In-Between Hotel doesn’t pretend to be a glamorous landmark in order to attract guests. In-Between Hotel will instead be camouflaged with patterns of bricks and slates, and quietly merge into your neighborhood. Houses and shops nearby will become temporary neighbors of In-Between Hotel and its guest. They will also provide various services such as dining for the guest. 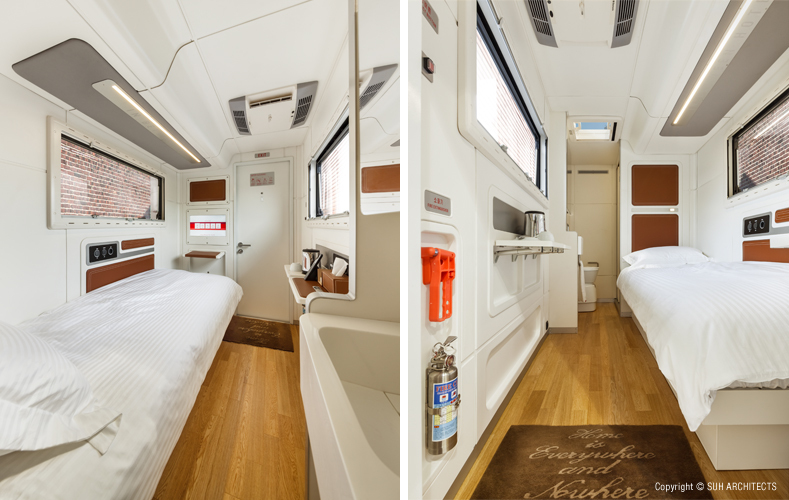 In-Between Hotel is not just a tiny hotel room on a truck. Your house or a shop may become part of the hotel and connect you with the guest. This hotel is also different in that your friendship with the guest will be part of their traveling experiences. The hospitality you offer will be part of the hotel environment. This is why you as an individual will become an important collaborator as well as the artwork itself. The hotel room will travel to a different location in between houses or shops before a new guest checks in. This will naturally expand the territory of In-Between Hotel throughout the city of Gwangju. Indeed the guest will walk into the artwork and become part of the work as well. In-Between Hotel will revive itself when a guest makes a reservation through its website. When the guest goes to the place designated by the website, a member of In-Between Hotel staff will appear there and take the guest to the space where In-Between Hotel sits. The guest who enters the hotel room can then look up his or her neighbors and owners of nearby shops – people like you — through a kiosk. The visitor can then read your greeting messages at the kiosk. You can introduce your shop’s best-selling item or your best breakfast menu. The guest can also learn about stories of previous guests who have stayed in the hotel room from other locations. The story might be about a street cat that lives in between spaces somewhere – or something more dramatic. The guest of In-Between Hotel will accumulate his or her own experiences of the hotel room to add to stories of other guests from other in-between spaces and times where the hotel stayed. 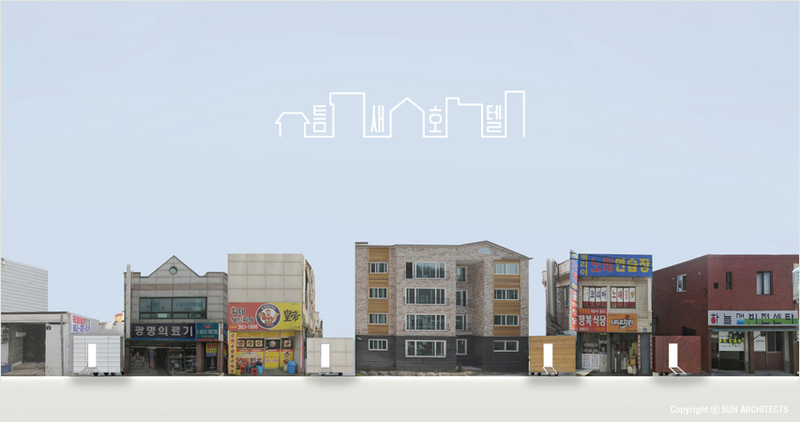 Those in-between spaces from various times and spaces will connect into a network, and create a new face of Gwangju — a face different from the one most of us already know from sites commemorating the grand epics associated with the city’s history. In-Between hotel will present a new face of Gwangju for those already living in the city, such as yourself. From when you were informed that a hotel will come into an empty lot next to your house that you have paid little attention to, you must have begun to see the lot in a new light. 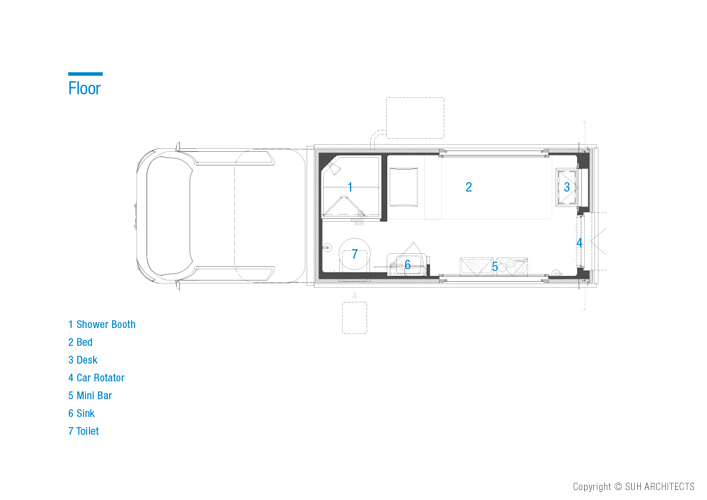 When the hotel room in the truck actually comes into the lot, the site will be transformed into a completely new space with the hotel, both physically and psychologically. That space will no longer be the same even after the hotel truck moves to another location, as it will contain new memories. Each in-between space that the hotel stays in will become different and unique, with the interaction and memories between you and the guest. Sometimes you and the guest might have different impressions of the same space and remember it differently. 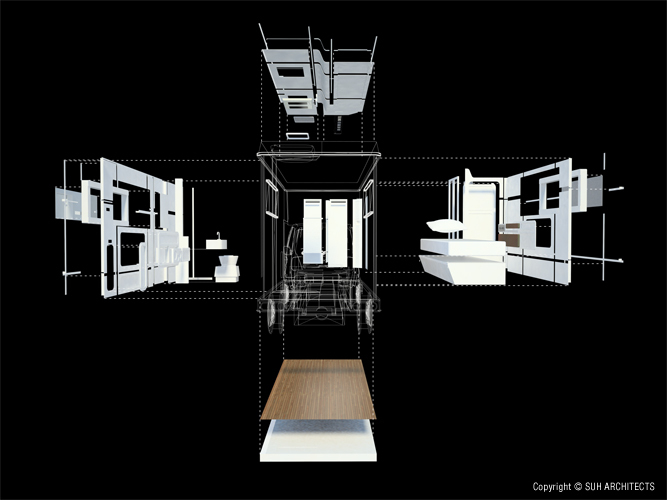 In-Between Hotel strictly locates within a certain context, and it shifts into various appearances depending on the context of time and space or even the psychological context of its participants. In-Between Hotel resists becoming a monument that will be independent from its surroundings and will be permanent. 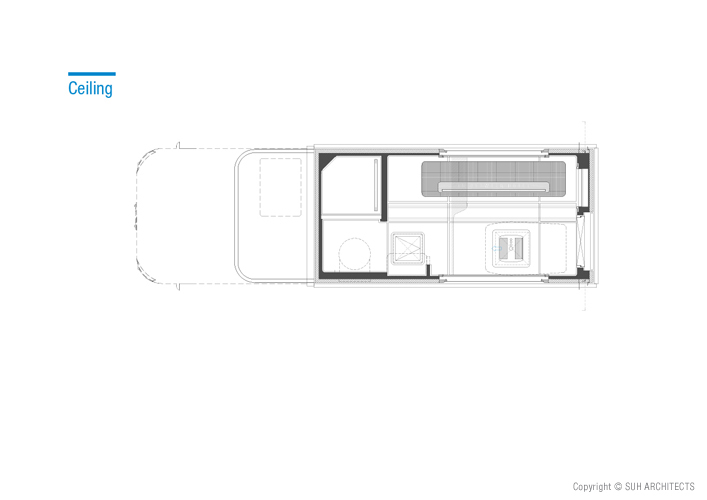 With its mobility and ability to attract citizens’ participation, In-Between Hotel will be an anti-monument that will actively relocate from one context to the next. 우리가 어딘가로 여행을 떠나면 주로 명소에서 명소로 공간 이동한다. 우리가 기억이나 역사 속으로 여행을 떠나면 주로 큰 사건에서 사건으로 시간 이동한다. 하지만 그 시공간적 지점들 사이에는 수많은 틈새가 있고 그 틈새 공간과 시간이 없다면 지점들은 연결되지 않는다. 광주의 거대 서사를 기념하는 랜드마크 사이 틈새가 없다면 광주라는도시 자체가 성립할 수 없을 것이다. 그래서 그 틈새에 관심을 갖는 여행자들에게 설치작가 서도호와 서아키텍스(호텔 디자인), 기아자동차 디자인팀, 이미지 베이커리(영상·멀티미디어), 스튜디오 와이, 어반인덱스.랩(광주 부지 리서치)이 협업해서 ‘틈새호텔’을 제공한다. 틈새호텔은 2012 광주비엔날레의 시작과 함께 광주의 평범한 이 거리, 저 거리의 건물 사이 이 틈새, 저 틈새에 슬며시 나타날 것이다. 집과 집 사이의 좁은 틈새, 명소와 명소 사이의 이름없는 틈새라는 이중의 틈새 속에 이 호텔은 자리잡는다. 여기저기 나타날 수 있는 것은 호텔방이 트럭 위에 얹혀 있는 덕분이다. 하지만 방 내부는 침대와TV, 화장실 등 여느 호텔방과 다를 바 없다. 다른 점은, 번쩍이는 랜드마크가 되어 손님을 끌려는 여느 호텔들과 달리, 틈새호텔은 벽돌무늬와 슬레이트무늬로 위장하고 양쪽의 집들 틈새에 튀지 않는 이웃으로 조용히 스며 들어간다는 것이다. 양쪽의 집과 주변 가게에 있는 사람들은 틈새호텔 투숙객의 일시적 이웃이자, 식사 등 각종 호텔 서비스의 제공자가 된다 . 그러니 ‘틈새호텔’은 트럭 위에 실린 조그만 호텔방만을 가리키는 것이 아니다. 투숙객의 이웃과 주변 가게들이 투숙객과 연결된 하나의 호텔이 된다. 그 이웃사람들은 투숙객이 필요로 하는 물질적인 것들뿐만 아니라 투숙객을 따뜻한 공기처럼 감쌀 인심 같은 비물질적인 것까지 제공할 것이다. 그러니 틈새호텔의 이웃 사람들 – 광주시민들 – 은작가의 협업자이자 작품의 일부가 된다. 그리고 트럭에 실린 호텔방이 새 투숙객을 맞을 때마다 광주의 또 다른 틈새로 이동하면서, 틈새호텔은 영역은 광주라는 도시 전체로 확장된다. 투숙객 역시 틈새호텔이라는 작품 속으로 들어갈 뿐만 아니라 그 작품의 일부가 된다. 틈새 여행자가 틈새호텔의 웹사이트를 클릭해 1박을 예약을 하는 순간 작품은 본격적으로 생기를 띠기 시작한다. 웹사이트의 지침에 따라 여행자가 약속 장소로 나가면 틈새호텔 직원이 여행자를 지금 호텔방이 머물러 있는 어딘가의 틈새로 안내할 것이다. 호텔방으로 들어선 여행자는 키오스크를 통해 주변의 이웃과 가게들을 확인할 수 있다. 키오스크는 이웃의 인사 메시지를 보게 될 것이고, 어쩌면 이웃집 아주머니가 가장 잘 하는 요리나 근처 빵집의 명물 빵이 무엇인지도 알게 될 것이다. 호텔방의 이전 투숙객이 다른 틈새에서 겪은 이야기도 보게 될 것이다. 이렇게 틈새호텔 투숙객은 다른 틈새 시공간의 경험 위에 자신이 지금, 이곳의 틈새에서 겪는 1박 2일의 새로운 경험을 쌓아 올린다. 그렇게 여러 시공간의 틈새들이 연결되어 네트워크를 형성하고 그것을 통해 새로운 광주의 모습이 드러날 것이다. 거대서사를 기념하는 명소의 점들로만 주로 드러났던 광주의 모습과는 또 다른 광주의 모습이. 틈새호텔은 광주에 이미 살고 있는 주민들에게도 새로운 광주를 보여줄 것이다. 그들은 평소에 전혀 신경쓰지 않던 틈새 공간에 웬 호텔이 들어온다는 예고를 접하면서 그 틈새를 다룬 눈으로 바라보게 될 것이다. 호텔이 말 그대로 굴러 들어와서 틈새에 자리잡으면 그것은 물리적으로나 심리적으로나 완전히 새로운 공간이 된다. 다시 호텔이 나가고 난 뒤에도 그 틈새 공간은 예전의 공간과는 다른, 새로운 기억을 담은 공간이다. 주민과 투숙객의 교류에 따라 각각의 틈새는 더더욱 서로 다른 공간이 될 것이다. 물론 한 동일한 틈새가 주민과 투숙객의 각각의 기억과 인상의 맥락에 따라 다른 공간으로 기억될 수도 있을 것이다. 이렇게 틈새호텔은 철저히 맥락 속에 위치하는 작품이며, 시간적, 공간적, 그리고 참여한 사람들의 심리적 맥락에 따라 변화무쌍한 모습을 보이는 존재다. 그러니 틈새호텔은 광주 폴리 프로젝트의 일환이지만, 상당히 기묘한 폴리라고 할 수 있다. 폴리는 본래 특별한 용도가 없는 장식적 건축물을 이르는 말. 기본적으로 주변 환경으로부터 독립적이고 또 영구적인 측면을 지녀서 기념비적인 존재가 되어가고 있다. 그러나 틈새호텔은 기념비가 되기를 거부하고 반복해서 적극적으로 이 맥락 저 맥락으로 옮겨가고자 하는 반기념비적 존재라고 할 수 있다. In Between Hotel Mark II is getting ready to recieve a guest. © 2019 SUH ARCHITECTS. All Rights Reserved.